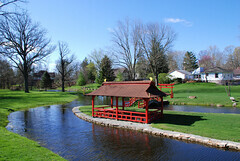 Hagerstown, Indiana is located in Jefferson Township in the northwestern quadrant of Wayne County. Children in this community attend Nettle Creek Schools..
A quintessential small town, Hagerstown residents have much to brag on. Historical tidbits like it being the hometown of Ralph Teetor, inventor of cruise control, or the fact that it was the northern terminus of the Whitewater Canal are documented in the local museum. 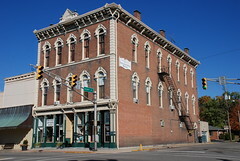 Visitors will also enjoy discovering soft, buttery caramels and hand-dipped chocolates from Abbott's Candy, in business in Hagerstown since 1890 or playing with the gyroscopes produced locally by Tedco Toys and shipped all over the world. 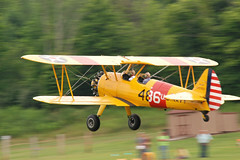 Hagerstown hosts an array of festivals each year, including Jubilee Days in August and a Vintage Fly-In at the Hagerstown Airport where pilots enjoy showing off their vintage airplanes on the largest grass strip runway in the nation in July. View more images of Hagerstown, Indiana. Geographically, the Wayne County Courthouse's latitude is 39°:49:44.292 North with a longitude of 84°:53:50.910 West.